A great mobile game is like a drug. Only better. It’s safe, legal, can be played in public and gives you instant gratification. In Candy Crush, players finish levels by swapping pieces of candy on a game board to make a match of three or more of the same color, eliminating those candies from the board and replacing them with new ones, which help create further matches. Matches of four or more candies spawn special candies that act as power-ups that have special powers to help clear up a board. Boards may have various goals that must be completed within a fixed number of moves or limited amount of time, such as a certain score or collecting a specific number of a type of candy. Games like Candy Crush are simple to play yet difficult to master. In part, they succeed because they are skillfully able to provide consumers a steady stream of small, bite-sized rewards as they play through the game. Candy Crush, which has been a top grossing game on both iOS and Android for years now, has been so successful that it’s been called addictive by fans and haters alike. What creates this type of addictive / compulsive behavior? Why can’t users seemingly stop playing these and other mobile games? The answer is dopamine. Dopamine is a neurotransmitter which, among other things, controls the reward center of our brains. When we do something which gives us pleasure or reward, dopamine is released into our system and gives us a little “high”. Mobile game makers from Supercell (makers of Clash of Clans and Clash Royale) to Rovio (Angry Birds) and Niantic (the developer of Pokemon Go) have all effectively figured out how to proverbially ‘give us a fix’ by creating and improving on games that give us a steady stream of these small highs so that we keep coming back to play more. The longer we play and the more time we invest, the more likely we are to spend money on power ups to keep our progress going and our addiction humming. As a matter of fact, there is a science to creating these types of games and as we can see in the article The Science Behind Addictive Mobile Games. In many ways, mobile games have become emblematic of today’s millennial generation along with social media apps like Whats App, Snapchat and Twitter and productivity apps like Slack, Gmail, Outlook, and Calendar. Mobile games have become so pervasive, that when I worked on Google play, they represented well over 70% of our downloads and more than 90% of our revenue. Nothing even came close to the colossal monetization power of games. But it’s not the addictive power of games that worries me when I think of today’s millennial generation. 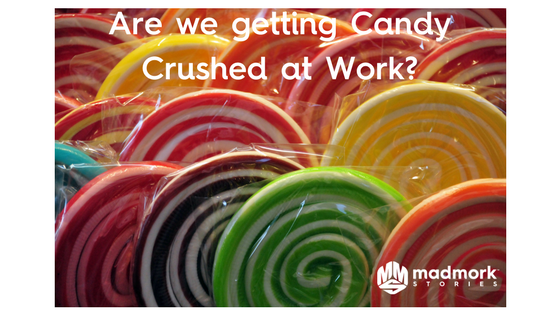 What concerns me more is the Candy Crush mentality that might be developing in our workplaces in general. I worry that some of the best minds we have might be working in a way that rewards and encourages the sort of short term wins and mentality that mobile games do. But life and work isn’t a game. Unlike Candy Crush, there is an end goal in mind when we’re working. There are revenue goals, user acquisition goals, code reviews and deliverables that require us to balance short term tasks with long term strategic execution. In my last role as Chief Marketing Officer at Course Hero I saw how people on my team struggled to balance getting things done vs. getting the “right” things done. My 1-1 meetings, which I held weekly, were often focused on revisiting priorities and managing the team’s workload. The challenge I found, not just at Course Hero but also in my previous roles at Google and GetJar, is that at times millennials confuse checking off tasks on insurmountable To Do lists with hard work. There is a perception, particularly in the Valley, that working long hours means people are working hard and are committed to the success of the organization when in reality many times they are trying to do too much, too fast and not necessarily doing the right things. For example, in a meeting I might notice that the person was tired, frazzled and fidgety. I also might have a conversation where the person shared that they were “maxed out”, over-stretched or simply not finding enough time to focus on their priorities. When I would ask why they were unable to deliver on 1-2 items that might be of particular interest to me or a key milestone we’d agreed to, they would show me their ever-expanding To Do list. A short review of the To Do list would often uncover that most of the items on the list were genuine and even important in some degree or form but the challenge was that as the list went from 15-2o items to more than 50 or so, it would become progressively more difficult for the employee to make sense of what needed to be done, by when and what should either be pushed back or eliminated. This is where the Candy Crush mentality kicks in. Most of us have To Do lists of some kind. In my case I use a workflow management suite called Asana which me helps create tasks, give them dates, sub-tasks and dependencies and even assign tasks to partners or clients. And guess what I love about my task list? I love checking off things as I get them done. I can’t wait to check that little box and see the airplane fly across the screen or see stars explode across my desktop once a task is completed. But I’m gray-haired and seasoned enough to know that what matters is that the right tasks gets done as opposed to how many tasks I check off in a single day. Even then, I have to admit that my task list is huge and I spend a part of my week removing, adjusting and re-prioritizing tasks based on my broader goals. The Candy Crush mentality of workflow productivity tools like Asana, Trello, Google Keep and Outlook isn’t the only force to blame for people feeling increasingly under pressure and unable to disconnect (because naturally each of these software tools has mobile and desktop notifications and emails which remind us 24 hours a day when we’ve just missed a deadline). Three other pieces of software also seriously limit our ability to be as effective at work as we’d like: Email, Slack and Calendar. The struggle with email management isn’t anything new. A quick search on Google turns up more than 58 million results one how to manage email more effectively with the oldest article on the topic dating as far back as 2006 with suggestions that are just as valid today as they were back when it was written. As long as I can remember people have struggled with email but in the Valley I think it might be worse. There seems to almost be an unwritten rule in the Valley around the need to respond to email within 24 hours. Not doing so is considered bad form but this is even more the norm in startups and early stage companies. Replying to that flagged or snoozed email brings nearly the same feeling as completing an Asana task: Complete the email, hit send and feel the small dopamine rush. Ah…so good. The problem is that people are constantly interrupted during the day by email, answering email at night (as my ex-wife often use to do from our bedroom) or answering emails during the weekend (when they should be recharging their batteries). As a matter of fact, Atlassian, a developer of productivity software, estimates that the average employee checks email 36 times per hour and spends 16 minutes to refocus on their current task after answering email. But if email wasn’t immediate or invasive enough, we now have Slack. Interestingly enough, Slack, which is one of the leading enterprise messaging services used by many companies today, originally was a mobile gaming company called Tiny Speck. As a matter of fact, this article in Business Insider details how one of the original characters in the game essentially became the Slack Bot that currently exists in the app and helps users do anything from get started using the app to alerting them of notifications. More importantly, the design and functionality of Slack also shows the developer’s understanding of basic human behavior by including game-like rewards derived from public accolades when you do something well (usually the posting of a fun emoticon by the thankful party). Slack is brilliant in that it allows instantaneous communication between employees using text, phone and even video. You can even include attachments, create private channels for particular projects and keep track of conversations. The challenge though, is that people are continuously interrupted by it in much the same way as they are by email. Worse, however, is that Slack’s nature as a messaging platform psychologically elicits a reply that’s even more immediate than email unless users turn it off. 5. The amount of time wasted in meetings costs us an estimated $37 Billion a year! 1. Learn to say NO. Sounds easy but I’ve had this conversation with many people on my teams over the years. You simply can’t do everything and please everyone. When in doubt about a request, see how it aligns with your priorities and / or check with your manager to see how this fits into the goals you have for that week, month or quarter. You might not be able to please everyone but start by pleasing yourself and your manager. Everything else follows from that. 2. Use your 1-1’s wisely. Most 1-1’s with our managers either happen too infrequently or are spent giving a manager updates. Updates can be done via, yikes, email or some other document. Ideally, you should be meeting your manager weekly and the 1-1 is a great time to go through your To Do list and remove things that shouldn’t be there, push things back or re-prioritize them based on your manager’s feedback. Not only does this help keep you focused but you can more easily say NO to requests when you know you’re aligned with your boss. 3. Meet with yourself. One of my favorite techniques to be productive is to create meeting blocks for myself when I need to focus on something. Usually, I’ll block off 1.5 hours in my calendar and schedule it as if it’s a meeting. I’ll also make sure I do this during the time of the day when I’m at my peak in terms of productivity to make sure I use the time efficiently. 4. Just turn it off baby! Whether you’re meeting with yourself or just focusing on getting something done, the surest way to be undisturbed is simply to turn off all distractions: Slack, your email, your calendar, the 16 tabs you have open in Chrome, and, of course, your phone. I know this might sound painful but if you really want to get **it done you need to turn that stuff off. 5. Plan each day before it happens. One thing I’ve found highly useful is to plan your day the night before. Think of what you absolutely need to get done tomorrow and how to schedule your day accordingly (like blocking out time to meet with yourself). One trick I use is to send a text message to my coach each morning with the 3-4 key things I need to get done that day. In the evening I send him another text to share how I did. Why? Because sharing our goals with others makes us accountable. Technology has enabled us to be more productive than at any time in history. However, technology can also serve as a huge distraction unless we learn how to make the best use of it and not allow it to control our lives. There’s a time and place to use technology and if we’re more disciplined about how we use it, when we use it and when we simply shut it down, we’ll lead simpler, happier and more productive lives. I hope these tips prove useful and, as always, if you enjoyed this post feel free to like, share and comment below Also, don’t forget to subscribe to my blog, follow me on Facebook and Twitter and check out my vcasts on YouTube. Now get back to work. You just spent about 10 minutes reading this post!